MRAID 3D Cube offers an interactive rich media experience allowing the user to reveal additional content while creating a 3D effect. A user opens a webpage or an app and sees a 3D Cube in the placement. After swiping or pressing the buttons, the cube starts to rotate and reveals additional content. 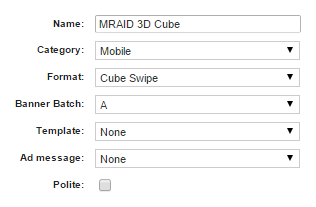 In the Initial Settings step, name your banner, select Category as “Mobile” and Format as “Cube Swipe”. Select a Banner Batch from the drop-down menu. In the next step, you are asked to select or upload assets. If you have previously uploaded the assets to the system, click the Select button and choose Banner source. Make sure that the clickTAG is present. Click the Next button and adjust the Settings. In order to deliver MRAID banners fully compliant with the specs, follow the instructions on Producing MRAID banners in Adform Test and Support Page.